Lawmakers, governors, candidates and island residents denounced Trump for saying that "3,000 people did not die in the two hurricanes that hit Puerto Rico." 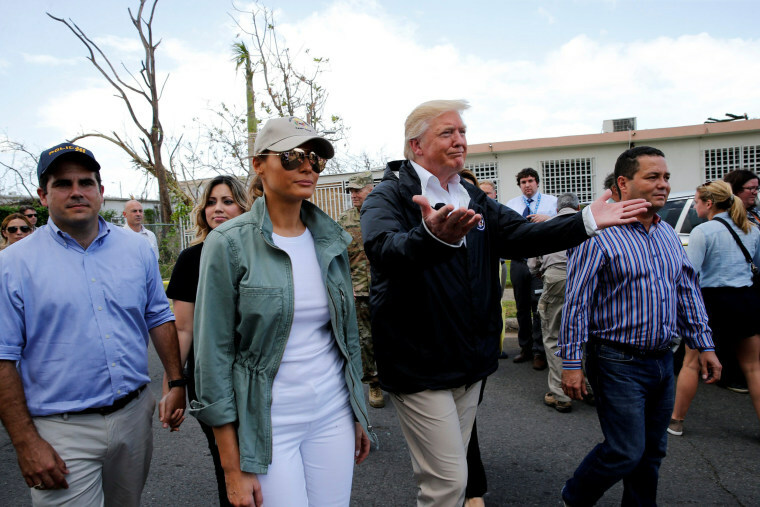 Democrats, top Puerto Rico officials and other island residents denounced President Donald Trump on Thursday for denying the large death toll estimate from Hurricane Maria last year and his baseless claim that Democrats had inflated the figures for political gain. Sen. Richard Blumenthal, D-Conn., said that Trump's claim was "beyond ridiculous" and "an insult to the brave men and women who everyday provide medical care and other first responder aid to people in distress situations." "The toll is factually established. The death toll in Puerto Rico is abominable and abhorrent. It’s a lesson in our need to do better. Puerto Rico is still a humanitarian crisis," he said. Sen. Elizabeth Warren, D-Mass., tweeted that Trump's claim was "a flat-out lie," while Sen. Bob Menendez, D-N.J., tweeted, "You're right, Mr. President. The Hurricane didn't kill 3,000 people. Your botched response did." Trump's tweets referred to an independent report, commissioned by the Puerto Rican government and conducted by George Washington University's Milken Institute School of Public Health, that found an estimated 2,975 people died in Puerto Rico in the five months after Hurricane Maria devastated the island last September. The number was adopted as the official death toll by the island's government. In a statement issued Thursday, the university said it stands by the science underlying its study. "Our results show that Hurricane Maria was a very deadly storm, one that affected the entire island but hit the poor and the elderly the hardest. We are confident that the number — 2,975 — is the most accurate and unbiased estimate of excess mortality to date," the statement said. In Florida, where there is a large Puerto Rican population, Republican lawmakers split with the president to affirm the official death toll. Sen. Marco Rubio, R-Fla., tweeted that "these days even tragedy becomes political." Outgoing Republican Gov. Rick Scott, who is running against Democratic Sen. Bill Nelson in a U.S. Senate race, tweeted, "I disagree with @POTUS — an independent study said thousands were lost." "I've been to Puerto Rico 7 times & saw devastation firsthand. The loss of any life is tragic; the extent of lives lost as a result of Maria is heart wrenching. I'll continue to help PR," Scott added. Nelson, for his part, called Trump's comments "shameful." The gubernatorial candidates from both major parties running to replace Scott rejected Trump's remarks, too. "No death is partisan and our brothers and sisters in Puerto Rico deserved better from @realDonaldTrump before, during, and after the hurricane," Democrat Andrew Gillum tweeted. A spokesman for Ron DeSantis, the Republican gubernatorial candidate in Florida, said DeSantis "doesn’t believe any loss of life has been inflated." "If I was his boss or standing next to him as his chief of staff, I would kick him on the ankle and say 'look, focus on the future damn storm,'" Lt. Gen. Russel Honore told MSNBC. Puerto Ricans, meanwhile, reacted with anger and disbelief minutes after Trump's tweet went out, ticking off the death and trauma they knew first hand. “I know a doctor who could not connect to a dialysis machine and died,” said Puerto Rico state Sen. José Dalmau Santiago. "No one told me — I went to the funerals," Dalmau said. Early estimates of deaths from Hurricane Maria were in double digits, first 16, later 64. But Maria wiped out the island's electrical grid for many months, not only robbing people of electricity for their homes but cutting off power to water pumps providing clean water to the island’s residents. Roads were littered and blocked with heavy tree debris, giant poles, signs, pieces of buildings and homes that were felled, ripped and scattered. Homes tumbled down earthen cliffs that gave way in the gushing rain and floods that followed and bridges were knocked out keeping people from getting to aid or aid getting to them. At one point during the aftermath, tempers flared when television images of supplies stuck at San Juan docks and not getting out to islanders. It took about a week for the administration to launch the U.S. Navy hospital ship “Comfort" to the island. It arrived on Oct. 3, almost two weeks after the hurricane hit the island. Once there, it initially took in a very limited number of patients. Many people had no way to refrigerate medicine for diabetes, to keep dialysis and breathing machines running, to get to medical care, to get clean water. Julio Santos, a church minister in Yabucoa, helped two bedridden seniors living in the community of Barrio Ingenio. They eventually died, despite efforts to get them supplies such as a generator, respirators and medication. He described islander's grief as "a silent pain." "We spent such a long time without power and then we lose Don Heriberto and Doña Blanca as soon as the power came back," Santos said. Santos said it is imperative to acknowledge the deaths of the elderly in Hurricane Maria’s death toll, despite Trump's comments Thursday that "if a person died for any reason, like old age, just add them onto the list. Bad politics." "If we would have had power, they would have lived longer," he said, adding of Trump, "That man has no emotions." “He doesn’t want to accept the reality,” Santos said. The official death totals were disputed from the start, and after investigations by news organizations and other groups the government commissioned an official investigation. That investigation, done by George Washington University’s Milken Institute of Public Health, found that 2,975 people died in Puerto Rico in the five months after Hurricane Maria. A separate Harvard study released in May estimated about 4,645 more deaths occurred in Puerto Rico from Sept. 20 to Dec. 31, 2017, than the previous year. Puerto Rico has been preparing to memorialize its dead and mark its recovery progress with the upcoming Sept. 20 anniversary — and the president's tweet slashed open still-healing wounds. "What I can tell you with certainty is that in our (island), we still have a lot of people in need,” said Rolando Ortiz Velázquez, mayor of the town of Cayey and president of the Puerto Rico Mayors Association. “Many people do not understand the magnitude of this disaster,” Ortiz Velázquez said. Puerto Rico Governor Ricardo Rosselló defended his government's adoption of the GWU study's death toll as the official count, and said "the people in Puerto Rico don’t deserve to have their pain questioned." Some Republican leaders seemed to disagree with Trump's claims about the death toll count, but held back from criticizing him. House Speaker Paul Ryan, R-Wis., said there was “no reason to dispute” the death toll of Hurricane Maria. He wouldn’t answer if the families deserved an apology.